I think I’ve finally cracked the secret of poached eggs! I’ve always loved poached eggs. It’s probably my favorite way to eat eggs. Sometimes I even poach them until the yolks are hard, which basically makes them a hot hard-boiled egg. 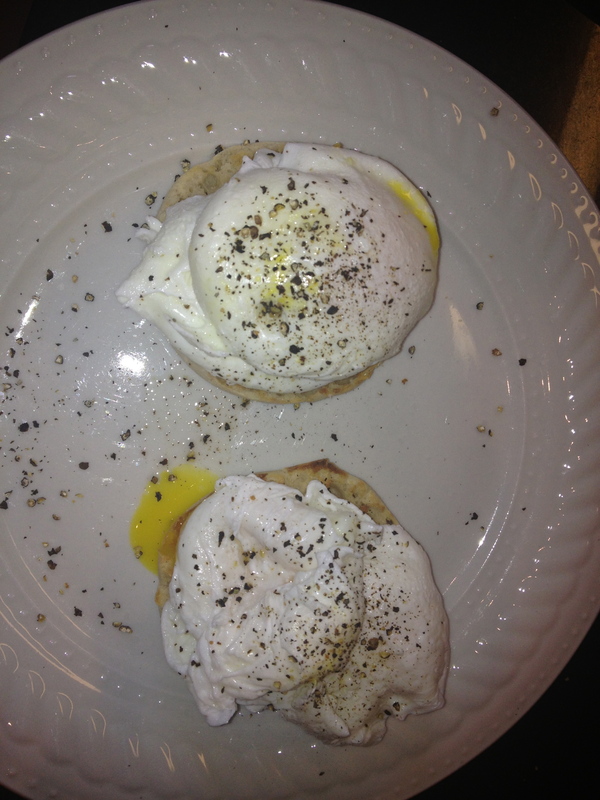 I’ve been practicing making poached eggs the authentic way. Putting them in the little medal cups in the special pan really makes “steamed” eggs. Poaching means cooking in liquid. This morning, I used a wider and shallower pan. I brought the water to just below a boil, where a fair number of bubbles were coming up from the bottom. I’ve always used the trick of putting a little vinegar in the water to help the egg whites bind together so the egg didn’t ooze all over the pan. But I’ve never been able to get them really stay in shape. I’d get a big stringing egg, that was all crosslinked, and sort of in the right shape, but with lots of straggling pieces. This morning, I dumped the egg from the measuring cup into the water FASTER, and it worked. They stuck together nicely!